Somehow Berkshire found a way to improve on what the manufacturer was already doing well with its 2018 lineup. There is an upgraded feel to the latest version from Forest River Marine that earned a lot of positive remarks from our testing crew. When implemented well, a solid accent color can truly improve the look and feel of a boat and that’s the case with this model. Marigold – a more attractive orange color – has been released for this upcoming year that shows up just slightly on the exterior panels and in the furniture to tie in perfectly with sport arch and ski/tow bar. We’ve always been impressed by Lexington furniture with the pattern variations and detailed stitching, but the latest offering feels even more inviting with the built-in headrests on the benches and the color combination. Cupholders have been recessed into the seats and now include two USB ports, which we all know you can never have enough of these days. One of the options is the JL Audio stereo system with amp and subwoofer and it earned high marks for overall sound quality despite only having four speakers onboard. Seriously, it was one of the best setups we tested. At the elevated helm is an attractive dash that includes a large Simrad color touchscreen with GPS mapping in the center with analog gauges on each side of the symmetrical console. If we had to be picky, we’d like to see a designated spot for your phone at the helm because most captains insist on using the playlist they bring onboard when it comes to the tunes. There are four chaise lounges with this layout, two in the bow and two in the stern, and built into the front bow one is a pop-up changing room that stands 5 feet, 8 inches tall when open. Other key features include a hidden sink and faucet forward of the helm, a solid ski/tow bar that includes an optional wakeboard rack, and this year the arch has been extended forward to provide even more shade coverage for the driver. The three-pontoon setup is part of the 3.0 Performance Package that includes lifting strakes and a full aluminum under skin. Forest River is now using a composite one-piece V-Lite performance deck on its boats that is 50 percent lighter than marine plywood and currently only available from this manufacturer. Up top there is over 21 feet of usable deck space from the bow gate to stern and even though there is not an actual rear gate, moveable stainless bars lock in place to help keep this area safe. The rail height varies from 27 inches tall for the majority of the boat to 22 inches tall in the bow. We’re not used to seeing pontoons go from zero-to-20 mph in under four seconds, but with the Mercury Verado 250 Pro we should probably just get used to it. She banks slightly in the sharp turns and really is fun to drive as we just missed the 50-mile-per-hour mark. 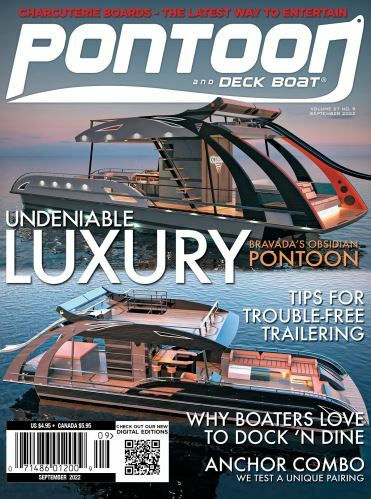 As a Berkshire Hathaway company, Forest River Marine has always found a way to be successful and stay relevant and the latest Berkshire pontoon is evidence of that. It feels very updated with added USB ports throughout the boat with an amazing sound system, yet still focuses on comfort and those added touches such as the Simrad touchscreen that help keep it user-friendly. Why we love this boat…Who says your sporty boat can’t be comfortable too? There is a lot of added value with this model that has a lot going for it including key amenities. Just being picky…With such an amazing sound system we’d love to see a designated area for the captain’s phone so it would be easier to plug into the media ports. One piece V-Lite performance deck/bow reinforcement bumper, Radius deck w/integrated deck trim, rub rail and aluminum corner pads, exterior “D” rail design on full rail panels, aluminum-framed low back (w/arms, headrest helm chair, and seat slider pedestal), pillow top furniture, black soft grip steering wheel w/tilt cable steering, fiberglass helm w/matte finish mahogany look dash, radio/toggle switch panels, Simrad color GPS graph w/analog gauges, USB charging port, Kicker KMC 10 waterproof radio (MP3, iPod, and Bluetooth compatible), four 165-watt lighted speakers w/protective inside covers, LED docking lights, oval-shaped wood grain table w/stainless steel base, extended stern platform w/transom washdown and 4-step telescoping stainless steel ladder, stainless steel ski tow bar and portside cupholders, stainless steel cleats/rail braces, Surlast 10-foot color-matched Bimini top w/stainless steel quick release and riser bracket, Surlast playpen cover, 27-gallon EPA-approved fuel tank in motor pod w/fuel/water separator, transducer brackets on port/stbd. tubes, privacy hoop and curtain, and Deutsch waterproof electrical trunk wiring harness. Super Sport trim pkg., 3.0 Performance Pkg., Silver RFX, Lighting Pkg., amp, subwoofer, JL Audio speakers, wakeboard rack, helm riser, dual batter switch/charger, reinforced splash fins, privacy hoop and curtain, and pair of USB back plates.